In many ways that are hard describe in words, it has been significant and deeply meaningful for me to attend Meeting Worship at Buckingham Friends School. I have witnessed many of our students accessing their piece of the truth and sharing their unique voice and perspectives. A powerful moment occurred for me last Friday, and it stirred a weekend full of reflection and appreciation. Friday was Upper School Day, a tradition at BFS for many years. 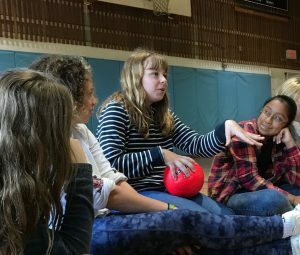 Students in grades 6-8 worked in mixed-age groups to engage in workshops and activities about decision-making as preteens and teenagers. Later, they participated in a series of skits and games designed to promote group building, risk-taking, and fun. It truly was a special and spectacular day. 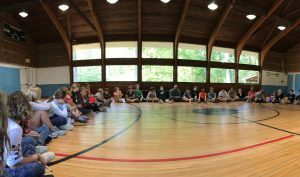 The “moment” occurred for me at 3:00, when, after a full and exhausting day, the Upper School community gathered and sat in a large circle in the gym. Silence settled over the gathered collection of students and faculty, and a small ball was passed around, offering the holder the opportunity to share with everyone else what they had experienced or considered as meaningful about the day. Many individuals spoke, including students and teachers new to BFS, Sixth Graders new to Upper School, and Seventh and Eighth Graders. What each had to say was authentic and heartfelt. 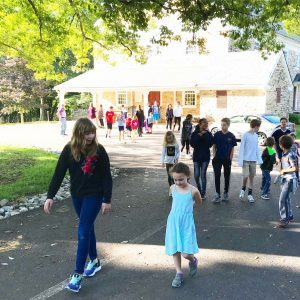 Some found their first moment to share with our community while others recalled their years in Lower School. Others affirmed the larger purpose of the day in personal terms while some speakers highlighted group effort and the positive outcomes for our community. Everyone’s collective reflections spoke to the purpose of the day while elevating its outcomes for us all. But, what really caught my attention was the fact that – at 3:00 on a Friday afternoon at the end of a big and busy day all over campus, when everyone was hot and sweaty and tired – the entire circle of attendees sat in still silence, all eyes and ears glued on the speaker, supporting and holding the moment with them. 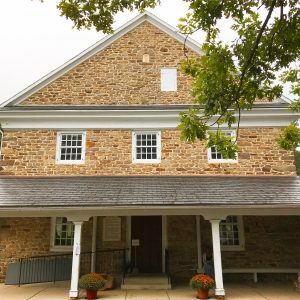 As is the norm in the Meetinghouse each week, every person demonstrated their ability to listen deeply and nurture our culture by providing a forum founded upon trust and a respect for the voices and ideas of others. This is wonderful. Thank you so much for sharing. I can understand more fully Friday’s experience through your words and photos. Thank you! It is great to have these very special moments at BFS captured and held up like this! Thank you!